Location/ Directions: I-71, Exit 235 (Bagley Road). West on Bagley to Engle (1st str) left. Courtyard is down the road on the left. About Hotel: 5-Stories, 154-Rooms, Interior Corridor, Non-Smoking Motel, Free high-speed Internet in all guest rooms, Hair dryer, iron and ironing board, Cable TV, free HBO, In-room coffee/tea, individual climate control, spacious work desks and ergonomic chairs, Guest rooms feature two dual-line speakerphones with voicemail, Air-conditioned, Connecting rooms are not available, Windows may be open ed, Alarm Clock, Radio, Fitness Center. Railroad View: Poor. During our visit in October 2010, heavy brush and a large group of trees prevented a railroad view. Taking a clear picture of a train from this motel is impossible. Winter time may increase the view. Staying next door at the TownePlace Suites is a better choice for both view & price. Notes: The TownPlace Suites next door is a little closer to the railroad, and was about $10 less expensive in our survey. Courtyard is less than a 10-minute drive to one of the east's busiest railfan hot-spots, Berea, Ohio. Photo Comments: The Courtyard is the building to the upper left. 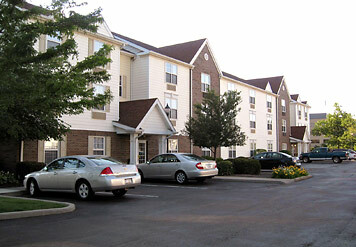 To the right of the Courtyard is the TownPlace Suites. Although the field of scope for viewing trains is small, trains blow their horn for the grade crossings located a quarter mile in each direction of the motel, this should give you ample time to get to the window. Picture looks north towards the Courtyard. Location/ Directions: I-71 South. Get off at exit 235 ( Middleburg Heights/Bagley Road). Turn right onto Bagley Road. Get into the left lane. Turn left at the first light onto Engle Road. TownePlace Suites by Marriott will be 1/4 mile down on the left hand side behind the Courtyard by Marriott. About Hotel: 3-Stories, 95-Suites, Free high-speed Internet & voicemail, Full kitchens with refrigerator, stove, oven, microwav e, toaster, coffee maker and utensils, Cable TV with free HBO, individual climate control, hair dryer, iron/ironing board, Pets allowed (non-refundable sanitation fee: $75 USD; contact hotel for details). Railroad View: Fair. Rooms on the east side of the buildings are a must for a railroad view. Southside of either building would be fine; eastside building is the closest to the railroad. The line is not very busy; about 10-15 trains a day use this line. Interstate 71 is just east of the motel (see photo), viewing trains approaching from the north is impossible until they are in front of you. Trains blow their horn for the grade crossings located a quarter mile in each direction of the motel. 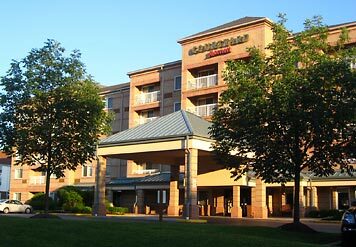 Notes: TownPlace Suites is less than a 10-minute drive to one of the east's busiest railfan hot-spots, Berea, Ohio. 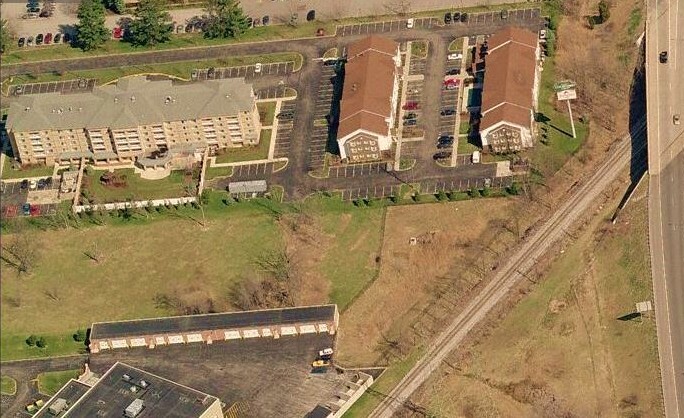 Photo Comments: Aerial photos show the short distance between the single track main and the TownPlace Suites. 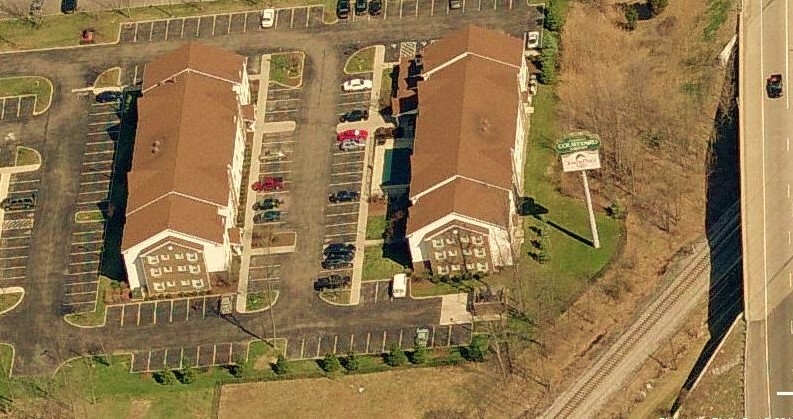 For those on a budget, these are several motels down the road that do NOT have a railroad view, but like this property, are minutes away from the Berea "Hot-Spot" train watching location.